The painter Rachel Ruysch spent most of her life in Amsterdam, raised in a cultivated and learned family. Her father was a distinguished professor of anatomy and botany, her mother the daughter of a prominent architect. 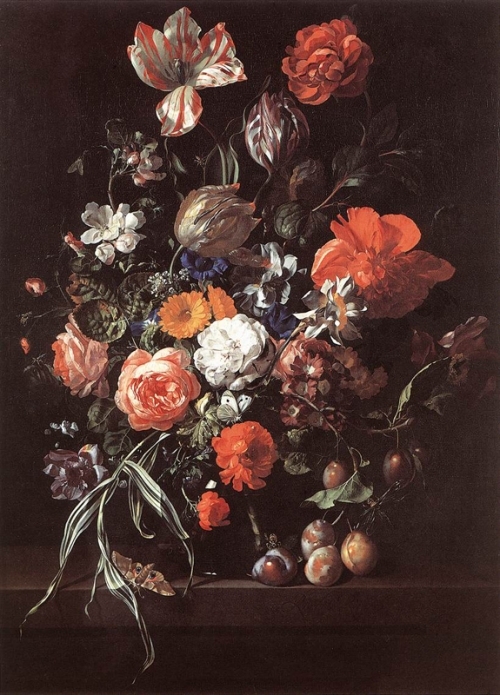 Her father’s profession, coupled with her apprenticeship (1679–83) to an artist well known for flower paintings, no doubt steered Ruysch’s own practice in the direction of still life. She became one of the greatest exponents of the genre, commanding high prices for her works and praised by many poets during her lifetime. In 1693, she married fellow artist Juriaan Pool, by whom she bore ten children. From 1708 to 1716, she was court painter to the elector palatine of Bavaria; some sources state that she and her husband lived in Düsseldorf, others that she remained in Amsterdam, making only occasional visits to the German court. In any case, by 1716, she was settled in Amsterdam, where she maintained her prolific output to the age of eighty-three.